With more than 30 years in the industry Carson Attorney Service has the experience to get the job done! Serving Process, Court, Skiptracing Anyone, Anytime, Anywhere! We've Got You Covered. Welcome to Carson Attorney Service! Our staff does whatever is necessary to complete your assignment. As members of CAPPS (California Association of Photocopiers and Process Servers) and NAPPS (National Association of Photocopiers and Process Servers) we employ licensed and certified staff who maintain continual education of all laws governing the service of process. 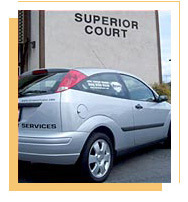 We are experienced in service ranging from SMALL CLAIMS to WRITS OF EXECUTION. We recognize that no two assignments are alike and we identify with our clients' special needs. Upon completion, our office will provide you with a judicial council approved proof of service in a timely fashion. Process Service: We are licensed and bonded process servers, qualified to handle all of your service of process needs. We stay updated in all civil code of procedure changes to ensure proper service of all your legal documents. Court Service: We file legal documents in all the bay area courts as well as research assignments, including same day filings and we are a fax filing firm, able to file by fax with all bay area courts. Writ Service: We have experienced, registered process servers who are up-to-date on the proper method of serving a writ. We open the file with the sheriff, serve the writ and file the proof of service with the sheriff in accordance with the civil code of procedure. Same-Day Service: We are equipped to serve your legal documents, file your documents with the court, and make your deliveries on a same day basis. We go the extra mile to ensure that your assignment is completed as requested. Skip Trace: We offer a variety of skip trace methods, according to you and your clients' needs. We have a high success rate in locating and serving most assignments. Statewide Service: As members of CAPPS we have an overnight pouch systems with many affiliates throughout the state and can have your service of process in the servers hands the next day. We use only the most reliable affiliates to ensure proper service. Nationwide Service: As members of NAPPS we have contacts throughout the United States and in some neighboring countries. We have taken the time to locate the most reliable process servers and maintain constant contact to ensure proper service in accordance with California Law. According to California State law, the person, corporation, or government entity you sue must be formally notified that you have begun the legal process, that any paperwork has been filed, and of any other proceedings within the case. This notification can also include a request for legal documents necessary to the case. This notification is called “service of process.” The documents you have served can be subpoenas, writs, notices, summons, and complaints, among others. You must have the documents served by a party uninterested in the legal case. It is often advisable to hire a process server, as many avoid being served and can be difficult to find. In California, a process server must be licensed or bonded and insured and should know the area they are serving well. Please don’t hesitate to ask if you have any questions about process serving. Complete the form below to get in contact with us. We will respond to your request quickly! Need a status? Email your status request and we will call you with an update. Need to arrange for a court assignment? Email your court assignment, request a pick up for filing or notify us that your are sending us a filing by mail or fax. Have a question about a writ? Need to have a writ processed? Email your questions and we will call you right away with the answers. Need to arrange for service of process? Email your request for pickup, or notify us you are sending us an assignment. Have a Do Today assignment? Email your assignment with complete instructions and we will get started right away. Need instruction forms, fee schedules, or promotional material? Want to open an account? Complete our forms request and we will open your account and send you a promotional package same day. © Copyright Carson Attorney Service. All rights reserved.